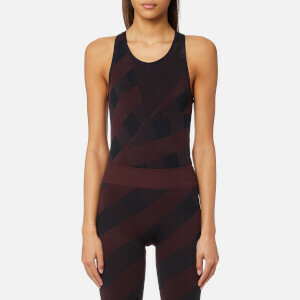 Women's relaxed fit workout vest from luxury sportswear brand, Monreal London. Crafted from technical, four-way stretch jersey with moisture-wicking properties, the 'Racer' tank top has been designed with colour block perforated panels, and features a scoop neckline, low cut arm holes and a slim racerback to the rear. Complete with a dipped hem and branded tab to the lower right hem.